NEW DELHI/BHUBANESWAR (Thomson Reuters Foundation) – Authorities in India have raided mica mines, arrested traders and begun steps to regulate the underground industry, local officials said, after a Thomson Reuters Foundation expose revealed a cover-up of child deaths in illegal mica mining. A three-month investigation in the mica-producing state of Jharkhand found that a flourishing black market had resulted in at least seven children being killed since June, mining for the prized mineral that adds sparkle to makeup and car paint. But the deaths went unreported as victims’ families and mine operators feared it could end the illegal mining of mica, the only source of income in some of India’s poorest regions. Mithilesh Kumar Singh, divisional forest officer for Koderma district, said his department had begun a crackdown on hundreds of mines and had so far arrested two people and registered cases of illegal mining against seven others in the past month. Five vehicles, including pickup trucks and vans, used to transport the massive piles of mica extracted from the mines, were also seized during the crackdown, he added. India is one of the world’s largest producers of mica, a silver-coloured, crystalline mineral that has gained prominence in recent years as an environmentally friendly material, used in the car and building sectors, electronics and “natural” makeup. But renewed interest in mica has sent illegal operators scurrying to access hundreds of closed, crumbling mines, many in the forests of Jharkhand’s Koderma and Giridih districts. Indian law forbids children below the age of 18 working in mines and other hazardous industries, but many families living in extreme poverty rely on children to boost household income. Following the Thomson Reuters Foundation investigation in August, Jharkhand’s labour department announced an inquiry. The findings submitted earlier this month said illegal mica mining was the main source of income for local people and confirmed some workers had died due to collapsing mines. However, it found no evidence of child deaths. The inquiry said three women from Haraiya village in Koderma had died on May 5 while extracting mica and cited claims by local village leaders that no children were involved in mica collection in the area and that all were attending school. Labour officials, however, said they had launched a public awareness campaign across the state to stop child labour and had rescued around 250 children working in places such as small shops and restaurants. “After your news report, we got the inquiry done. The labour commission are taking necessary action,” Principal Secretary of Jharkhand’s Labour and Employment Department S.K.G. Rahate told the Thomson Reuters Foundation. Authorities also said plans were underway to begin regulating some mica mines in the illegal sector, which is estimated to produce 70 percent of India’s annual mica output. This would not only provide important revenue for the state, but would also regulate the sector and ensure that mica mining is conducted safely and without the involvement of children. A geological survey to determine the amount of mica reserves has begun and once this has been completed, authorities say they will demarcate blocks and begin auctioning mining leases in early 2017. Kumari Anjali, director of Jharkhand’s geology department, told Thomson Reuters Foundation that officials had already visited the districts of Koderma and Giridih to conduct surveys and that they would submit a report to the government on Friday. 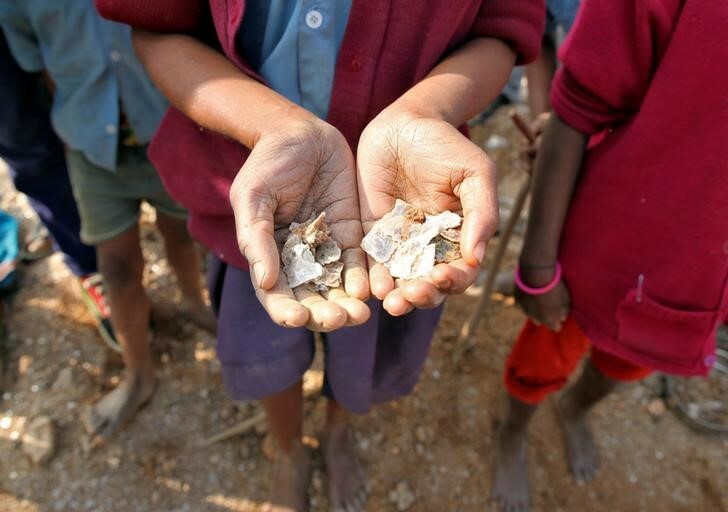 Child rights groups in Jharkhand said the Thomson Reuters Foundation expose had been a “big blow” to illegal mica mining activity in the area and welcomed moves by the government in the aftermath, but said much more action was required. “The Thomson Reuters Foundation report created waves. There are steps to auction the open pit mines and raids have been conducted on illegal mica traders,” said Raj Bhushan from Bachpan Bachao Andolan (Save The Chilhood) in Jharkhand.